Seven Galaxies stories now available! A few years ago, I wrote two short stories for Fear the Boot’s Sojourn speculative fiction anthologies. The rights have reverted back to me, so I am making “Forgotten Dreams” and “The Pleasure Pools of Persiphia” individually available on Kindle. They are $0.99 each. If you prefer print, they’re still available in the Sojourn anthologies, but I will also have a convention-exclusive flipbook version available starting at ConQuest 47 in Kansas City, MO. The flipbook has both stories bound together, but they’re upside down with respect to each other. When you finish one story, you close the book, flip it over, and start the other. Since they’re not sequels (though they share a setting), it doesn’t matter in which order you read them. I plan on selling the flipbook for $5 only at conventions (ConQuest, Gen Con, whatever other shows I exhibit at). I will likely also offer direct sales of these, so if you can’t get to one of my convention appearances, I’ll have something set up for you to send me $5 +shipping via PayPal and I’ll mail a signed copy out to you. You may ask, “Well, why not make it permanently available in print on Lulu or someplace like that?” Very simple: they won’t guarantee consistent results with the flipbook. Automated systems don’t like seeing half of a print file upside down. Plus, I would have to sully one of the beautiful covers with a barcode and since each side is upside down with respect to the other, placement is problematic. Later this year, I may investigate making individual print copies available, but the price I’d have to charge to make it cost-effective may not be worth your while for a 10,000-word short story. Please note: production of these is not in any way holding up production of Scars of the Sundering, book 2: Lament. Lament is currently with my editor and Beta Readers. Cover art has been ordered and everything is on track for a Gen Con release. Scars of the Sundering, book 3: Salvation is written. Editing will begin on that once Lament is published. I kind of slacked off on blog updates for the last 6 weeks or so. I had intended to update once-a-week through NaNoWriMo, but clearly, that didn’t happen. What did happen was I got involved in writing my manuscript an felt that any time I spent writing something else was time when I wasn’t working on my novel. Ironically, I’m still working on that novel. I ended NaNoWriMo somewhere in the mid-70K range, so it was a successful event. I’ve been plugging away through December and am currently sitting at just over 109,000 words. The first book in the series had a 110,000+ word first draft, so I’m not surprised. I hope to finish this one up here in the next couple of weeks, then take a few weeks or month off to work on some other projects. The first book, Malediction, will undoubtedly need revisions during that time (and I’ve been tweaking it as required while I work on book 2, Lament. I anticipate work on book 3, Redemption (or Revelation, still haven’t decided), to begin near the end of February or early March. Sales for 2014 were pretty sluggish. Granted, I wasn’t doing much to market anything. Royalties from my Seven Galaxies story in Sojourn turned out to be my biggest consistent money maker in 2014, so I have high hopes for the revenue from having two stories in paid anthologies. My sales at signings and conventions were pretty good, though. My Gen Con sales more than paid for my inventory costs this year, and I think, the costs of the table. It didn’t pay for the hotel though, but since I was going to go to Gen Con anyway and stay downtown in a hotel, that would have been an expense regardless of whether or not I sold any books. Now, when I talk about revenues, I’m talking about numbers on the order of $25 a QUARTER as being my largest source. Obviously, I’m not pulling in enough money to quit my day job yet. Still, reviews have been good overall, so people who don’t like my stories obviously don’t care enough to leave negative reviews (the worst review I have is on Goodreads, and it is a 2-star, no-text review of The Foundation of Drak-Anor compilation I sold at Gen Con; the reviews of the individual novels in that omnibus average above 4.6 out of 5). I would like more reviews though. They really do help motivate me to keep writing. For 2015, I’m looking forward to completing the Scars of the Sundering trilogy. I have already engaged an artist to do the covers for me, as well as a cartographer to update the map. Book 1 is in the editing stage, Book 2’s first draft is probably 10-15K words from being finished, and I have a lot of ideas for Book 3. I plan to write a short story for the as-yet-unannounced Sojourn 3 anthology, as well as, another Zack Jackson novel (Zack Jackson and the Secret of Venus). I’ve also been developing an urban fantasy setting (think along the lines of Hellboy/Dresden Files/Anita Blake before they focused solely on paranormal erotica) and a series of children’s fantasy picture books. I don’t know if anything will come of those last two in 2015, but development will certainly continue. There will be a few surprises at my public appearances, too. One other thing that will happen in the first quarter of 2015 is another interview series with the authors of the stories featured in the second Sojourn anthology. Depending on how many I get, there will be 1-2 posted a week. It’s a larger book with more authors than the first anthology. If you haven’t checked out the Sojourn anthologies yet, you can get them from Amazon and other book stores. 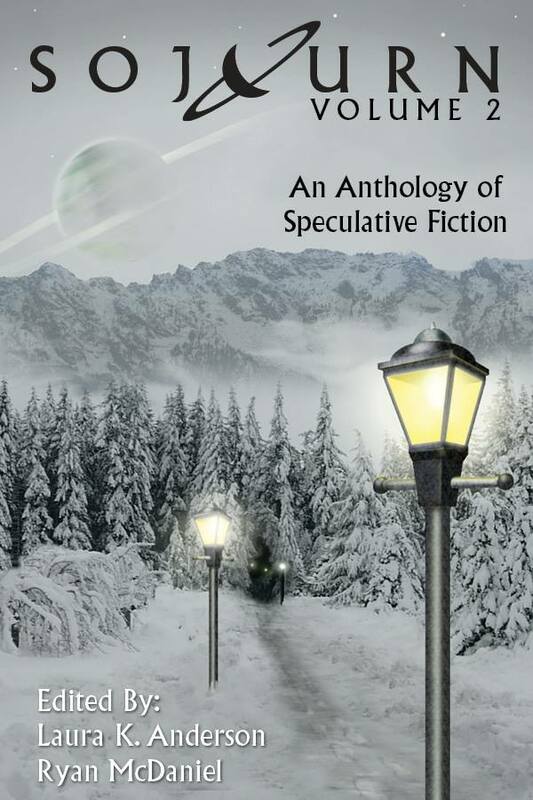 Sojourn: An Anthology of Speculative Fiction is now available! Last year, I submitted a short story to an anthology being published by Fear the Boot, LLC. The anthology is now available! My story is “Forgotten Dreams,” the first, I hope, of many tales set in the Seven Galaxies. Think of it as dark space fantasy. Kind of like high-tech Spelljammer, if you remember that TSR property from the late 80s-early 90s, but a little bleaker. It’s not as dark as Warhammer 40K, or even Game of Thrones. It’s definitely space opera compared to my Zack Jackson novels, though (and definitely NOT for children). I’m working on another Seven Galaxies story in case there is a second volume of short stories. “Forgotten Dreams” tells the story of Jahni, a former slave in a universe where all of humanity is enslaved and seen as barely a step about animals. She looks for a way to aid in the struggle to free her people and is forced to ask herself how far would she go to fight humanities’ oppressors. More are being added as the anthology works its way through the distribution network. A while back, I did an interview with SciFiPulse Radio. The episode went live today! You can listen to it here. I talk about my fantasy novels and my young adult science fiction novels, and I may have completely put my foot in my mouth when I talked about one of my homosexual characters, ’cause talking off the cuff is NOT something I should be allowed to do. Ever. So for no other reason than that, it should be entertaining!